I’m a sucker for Japanese-themed strategy games. Shogun, of Gamemaster series acclaim, now more commonly known as Samurai Swords or Ikusa, is one of the great strategy board games of all time. I love Total War: Shogun 2, and I’m even involved in a RPG-by blog based in Imperial Japan. Something about the lore of the samurai, the ninja, and the daimyo piques my interest every time. Naturally, when offered, I jumped at the chance to review Age of War by Fantasy Flight Games. I also admit my first impression was one of surprise and disappointment. The box is tiny – just 5 inches square. How can a great strategy game on par with Fantasy Flight’s many offerings fit into such a small parcel? The most important aspect of this game is that it has the genius of Reiner Knizia behind it. The mind that created perhaps the most challenging cooperative strategy board game in recent history, Lord of the Rings, demonstrates a deft capacity for elegant simplicity. This is a light-weight game. The mechanics are simple, borrowing from – dare I mention it – Yahtzee! First, fourteen castle cards are placed on the table face up, representing the fortifications of regional daimyos which must be conquered. The cards indicate the combination of forces which must be defeated to claim the card. The tip of the cap to America’s favorite Eisenhower-era dice game is the combat mechanic. Players take turns rolling the seven game dice, each displaying six symbols: one, two, or three infantry (katanas), archers, cavalry, and daimyo. To claim a castle card, the results of player’s dice rolls must match the forces on that card. The trick is that the card forces are arrayed in battle lines, and only one battle line may be attacked per roll. Furthermore, dice that are used to defeat a battle line cannot be rerolled in the same turn, so a player’s ability to defeat the remaining battle lines is reduced with each roll. If all battle lines on a card are not defeated during a single turn the attack has failed and the card is back to full strength, ready to defend against the next player. Victory gains the player the card and the number of victory points listed on the card. Players get to make their first roll before deciding which card to attack, and many times the result of that first roll will reduce the options. Given the availability of symbols on the dice, defeating battle lines consisting of cavalry, archers or daimyos is more difficult, and attacks against cards heavy in those forces have a greater chance to fail. Another layer of complexity is that the cards are grouped into clans, and conquering all the cards of a single clan and controlling those cards until the end of the game gains that player bonus victory points. 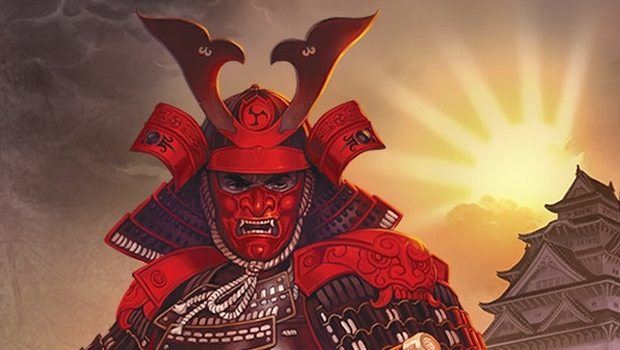 Players may also target cards already controlled by another player, but in addition to defeating the battle lines on that card, the attacking player must also defeat a fourth battle line representing the defending player’s daimyo. The game ends when the last castle card is conquered and the player with the most victory points wins. What’s missing from Age of War is any way for players who have hit a run of bad luck to recover. I’ve watched fellow players sour on the game and not want to give it another shot. That’s probably why the game is recommended for ages fourteen and up; most six-year-olds could learn how to play but are less likely to be good sports when the dice gods turn against them. The theme appeals to hobbyists and the mechanics, duration, and accommodations for as many as six players make this a quality filler game. Despite its small size, the pieces are on par with Fantasy Flight’s standard of excellence. Purchase it direct through FFG and get it for $12.95, an appropriate price for this nice little stocking stuffer. A fast little game that can be played by up to 6 players. Will appeal to hobbyists and novice gamers alike, and is also a good family game. Would make a nice stocking stuffer this holiday season.